Hotel Alpes Provence is located between the Rhone Valley and the Alpes, near the village of Bourg-de-Péage. It offers a swimming pool and free private parking. The guest rooms can accommodate from 1 to 4 people and are equipped with a private bathroom and a balcony. Free Wi-Fi internet access is available in public areas. Alpes Provence has two restaurants. The Restaurant Routier serves a simple set menu for lunch and dinner during the week. The hotel's gastronomic restaurant offers a range of regional dishes and has a well-stocked wine cellar. 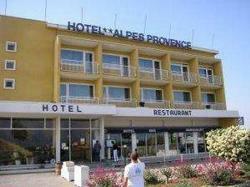 Hotel Alpes Provence is 5 km from Valence TGV train station. The centre of Valence is 13 km away, where guests can visit the 11th-century Cathedral of Saint Apollinaris. The swimming pool is open only during the summer months from 14:00 to 19:00. Restaurant service is available Monday through Friday from 12:00 to 14:00 and 19:00 to 21:45. Last orders for dinner on Friday nights is 20:30. The bar and restaurant are closed at 17:00 on Saturdays and Sundays. Please advise the hotel if you intend to arrive after 23:00 otherwise the reception will be closed. The Quadruple Room is 16 square-meter-wide and features 1 large bed + 2 single beds. The Triple Room is 16 square-meter-wide and features 1 large bed + 1 single bed. The Twin Room is 13 square-meter-wide and features twin beds. The Double Room is 13 square-meter-wide and features 1 large bed.